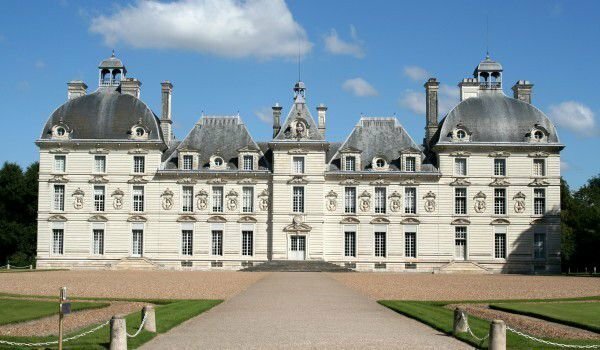 Cheverny Castle is located in the French department of Loir-et-Cher, which covers the area of the picturesque Loire Valley. The castle has absolutely no grounds of Renaissance Architecture and was built in the classic style of Louis XIII. Distinctive for Cheverny Castle is the symmetry, which is both in the building of the castle and in the adjacent gardens. Early in the 17th century the whole palace was built of white stone blocks, which were mined in the valley of the Cher. This type of construction material is interesting in that it retains its permanent white but also over time becomes more robust and stable. Despite the relatively homogeneous overall architecture, contrasts in styles are found in several of the roofs, which represent different architectural trends and style. 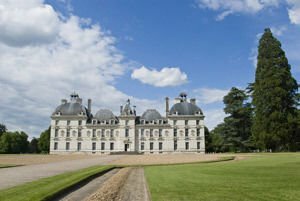 The original occupant of Cheverny Castle was a French Lieutenant-General, Henri Hurault, who was military commander of Louis XIII. Supposedly, however, only some parts of today's palace are authentic to the time of its construction. Interestingly, there is still no reliable evidence that the oldest parts of the building are in fact authentic to the time at which the general lived there. There is a picture of the palace, which is sealed in its appearance as early as 17th-18th century, but even that does not secure reference to what is preserved today as it was in those centuries. Contemporary Cheverny was reconstructed in exactly the same form of the original castle, which was almost destroyed. The interior of the castle is the work of artist Jean Monier and still there are unique masterpieces on the walls of Cheverny Castle which can be seen today. Thirty-four painted wood panels adorn the walls of the dining room with incredible moments in the history of the character of Cervantes - Don Quixote. The royal hall is situated on the first floor, which boasts a gorgeous design. The decorative Ceiling Panel recreates scenes of duties from Perseus and Andromeda, and some other.